We are back from vacation and, wow, what a trip! We did a cameo visit to St. Louis followed by a much more rigorous tour of Memphis and Nashville. This trip was to celebrate our 25th wedding anniversary and, in some respects, was the honeymoon we never had as newlyweds. When we were married in June of 1990, we spent a couple of days at a bed and breakfast in Ithaca, near Taughannock Falls. While it was nice, we were still in Donna's home state, and because we were young, in-love and trying to economize, we called it our honeymoon, while promising ourselves we would do something bigger one day. I kind of alluded to our drive by of St. Louis the other day, so I won't expand on it much. We got a late start, so got there at the beginning of a Cardinals game which made travel nearly impossible. Got a couple of pictures, saw the arch, saw the stadium, done-finished, get me out of here. Will see it more on a separate trip someday. Off to Memphis we went. 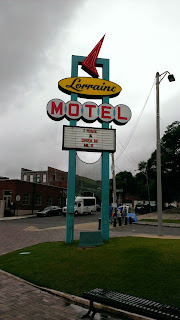 Our first stop was the Civil Rights Museum. 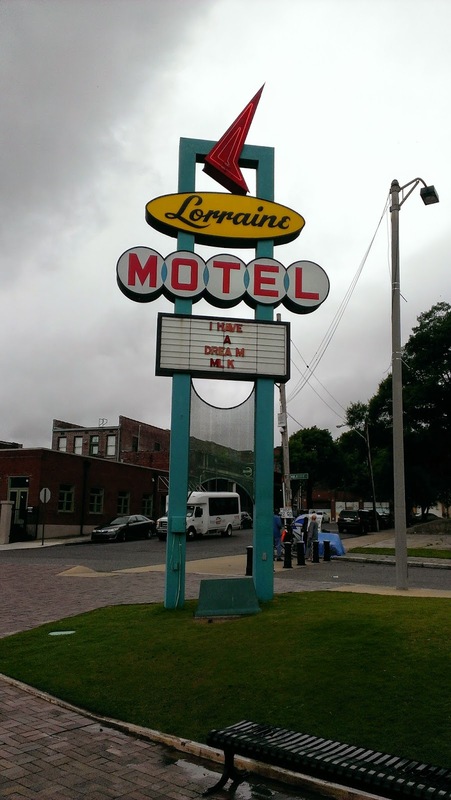 It is actually housed in the old Lorraine Motel where MLK II was assassinated. The museum impacted me in ways I'd never anticipated. I guess one of the more surprising things to me was that African slaves were not just shipped to America, but to South America and Asia and India as well. What impacted me the most was seeing a display of a slave ship where the captives were kept under decks. That and the fact that they were ripped from their homes, bound, sold as property and then worked like dogs. Man's inhumanity to man at it's worst. How could anyone ever have thought this was right? As if that was not enough, from there we rolled right into the era of civil rights 1950-1970's. Gut wrenching, tear jerking injustice. Jim Crow laws, persecution, KKK, and more. In talking to my wife, I wondered how differently our country would look if slavery never happened and our two cultures were assimilated naturally. People can boast that we wouldn't be one of the most powerful countries in the world had we not experienced the economic growth that slavery provided. My response to that is, at what cost? Again, the educational exhibits throughout the museum were moving and enlightening for me. Events like the Selma march, things that I should know more about, were well documented. All of it made me want to research and learn more about those years. In many ways the tension of those times were the direct cause of my father's murder in 1967. I even got the timing wrong, as Martin Luther King Jr.'s assassination occurred almost a year after my dad's death. I always thought it was before. This showed me I need to brush up on my history. 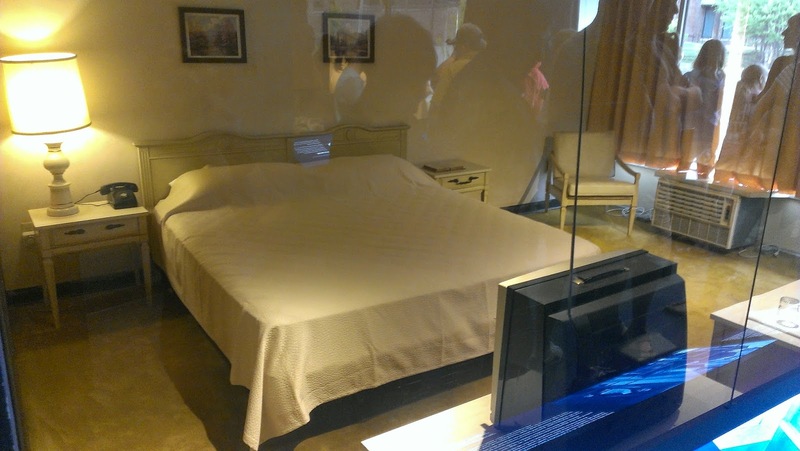 Of course, the most impactful part of the whole museum was walking through the doors and seeing the bedroom where MLK slept and the balcony where he was shot. It was a step back in time. I remember vividly the news that day, showing the balcony repeatedly. Being only six years old at the time I didn't know the full implications of his assassination. After my sister explained the significance of the killing of a black leader, I do recall wondering why blacks and whites hated each other enough to kill one another. It was beginning to look like a pattern, and it scared me as a kid. What a tough thing for a kid to process during their formative years. 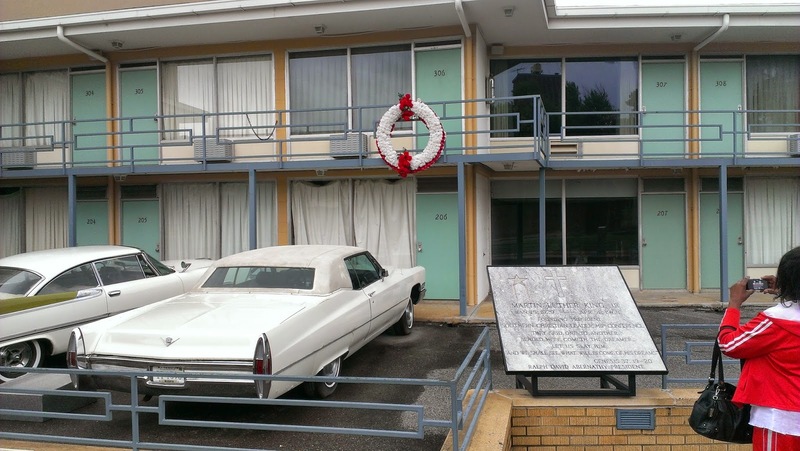 From there, we went across the street to the rooming house where James Earl Ray stayed the night before the shooting. 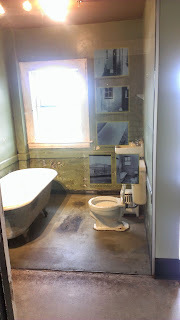 While we weren't allowed into the actual bathroom that he shot from, it was still extremely eerie being in that place. It had a sickening feel to it, at least from my perspective. long ago forgotten, that James Earl was captured in London as he tried to flee the country about 6 weeks later. Again, I need to brush up on my history. So, suffice it to say, that it was a tough museum to go through, but I am so glad I did. It opened my eyes in ways that reading about Civil Rights never could. More about the rest of the trip in future posts.